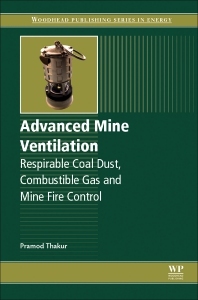 Advanced Mine Ventilation presents the reader with a unique book providing the theory and applications for designing mine ventilation with computers, controlling respirable coal dust and diesel particulate matter, combustible gas control and, mine fire management. The book summarizes the latest knowledge created in the past 40 years in these areas. Authored by an expert in the field with 50 years' experience, the book is a great combination of theory and applications. The mine ventilation section provides computer programs (both FORTRAN and C++)　to calculate not only air quantities and pressure losses but also the concentration of any pollutant in all junctions and branches of the mine network. Small particle mechanics and dust control is covered in the second section of the book. The third section on combustible gas control discusses all aspects of mine gases from origin to control. The last section on mine fire control discusses spontaneous combustion, frictional ignitions, mine explosions, and mine sealing and recovery. The book is not only a very good reference book but also an excellent textbook for two graduate level courses in Mining Engineering. Dr. Pramod C Thakur is the president of a consulting firm, Expert Solutions for Mine Safety (ESMS) LLC, in Morgantown, West Virginia, USA, and an adjunct professor at the West Virginia University. He served the coal industry for 50 years. He began his career designing mine ventilation with Andrew Yule & Co for 8 years. During his last 42 years with CONOCO, CONSOL Energy and Murray Energy, he developed four different techniques for mine degasification and coalbed methane production. He researched respirable dust control and diesel exhaust dispersion at the Pennsylvania State University. These techniques are used not only in the United States but also in many countries overseas. Appointed by the Governor of West Virginia, he served as a commissioner for 18 years and wrote the WV Diesel Regulations that serves as a model for the global coal industry. He is a distinguished alumnus of IIT(ISM), India, and a Centennial Fellow of the Pennsylvania State University. He is a member of the Society of Mining, Metallurgy, and Exploration (SME), USA, since 1969. He has written four books on mine ventilation and coalbed methane control and published more than 50 papers in technical journals. He has been awarded the Howard Hartmann and Howard Eavenson Award for excellent work in mine ventilation engineering and mine health and safety by the SME.